Just yesterday, I visited Picán in downtown Oakland with some co-workers for lunch. We were celebrating finishing up a project and our supervisor thought it'd be nice to have a little reunion. 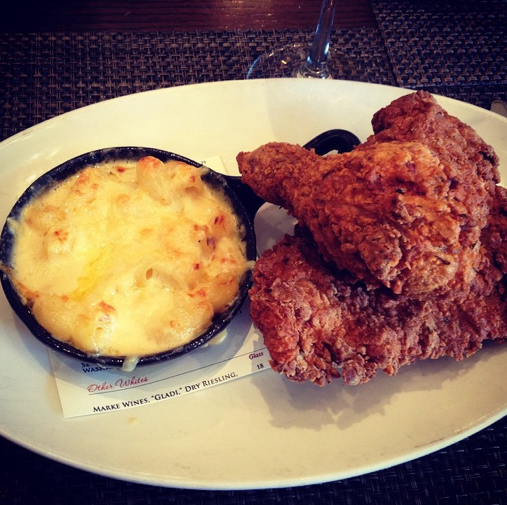 I was told the fried chicken was great, as well as the mac and cheese, so I thought I was going to have to choose between the two. But it turns out, mac and cheese is really only served as a side dish (or so I saw), so I didn't have to choose. My fried chicken came with it anyway. Picán makes their small side dish (and yes, it is pretty small, but again, it's a side, not a full meal like some places serve it as) with smoked Gouda. There wasn't really any fancy about the topping, but it felt like it had a big of a baked cheese texture which was pretty tasty. The sauce was very creamy and very rich. The flavor was a bit one dimensional since it was just Gouda, but since Gouda is a pretty strong flavored cheese it's pretty great on it's own. Definitely worth ordering if you find yourself there for lunch (or dinner). Try to find something that includes it as a side dish or substitute. Also, just so you know, they have a GREAT cocktail and bourbon list. I'm looking forward to one day going back to try some more of that, too!